Why wait for the weather to reflect what you feel? At Modigliani, our minds are on spring despite recent snow. Some might say it’s silly to allow our imaginations to scamper off to sun-dappled days prematurely; we say that to embrace la grande vita means to indulge in a little dreaming now and then. When our thoughts drifted to the warmer season just weeks away, an unexpected pattern came to mind: plaid. Though solid green has long been a vernal symbol, we think it’s time for more patterns and colors to have their time in the (spring) sun. In our new Primavera collection, several shades come out to play: cerulean, sky, and marigold mingle with earthy greens and browns, depicting a quintessentially spring floral motif. The collection also brings a playful plaid to the mix, and we think it’s a pattern perfectly befitting of spring. It appears we aren’t alone, either. We’ve noticed plaid gracing catwalks and interiors lately. Small doses of plaid are enough to make a large impact on any space, ensemble, or tablescape. Whether you’re incorporating an antique plaid picnic basket into a vignette, adding a dash of color to your outfit with a lightweight plaid scarf, or using a spring-hued plaid runner to ground your centerpiece, the pattern adds just the right hint of fun and quirk. Just look at the layered look of the plaid Primavera lunch plate peeking out from beneath the floral salad plate; it shows that a little of the pattern goes a long way. Plaid has always seemed at home in fall and winter, partially because the pattern often comes in more autumnal and winter shades like orange, red, brown, tan, white, and black. But as our Primavera collection shows, plaid isn’t a pattern reserved for woolen throws, flannels, and other fall staples. Designers, including our own Italian artisans, have reinvented the pattern as a spring motif, largely by trading out more earthy tones for brighter colorways. Spring fashions feature bold color pops in plaid patterns. Interior designers are incorporating more vibrant plaid drapes, upholstery, bedding, and more to create a fresh aesthetic. When it comes to plaid, any shade goes, making the pattern transcend seasons! Two busy patterns? No problem. People aren’t shying away from combining plaid and floral nowadays. Designers may pair a plaid shirt with a floral skirt or line a plaid button-down with floral fabric that peeks out from cuffs and collars. Stylists place floral pillows atop plaid shams for a collected feel. Like the combination of floral and plaid in our Primavera line, these juxtapositions work because – despite the contrast between plaid’s more rigid, geometric lines and floral’s organic forms – the colorways coordinate, producing a cohesive look. 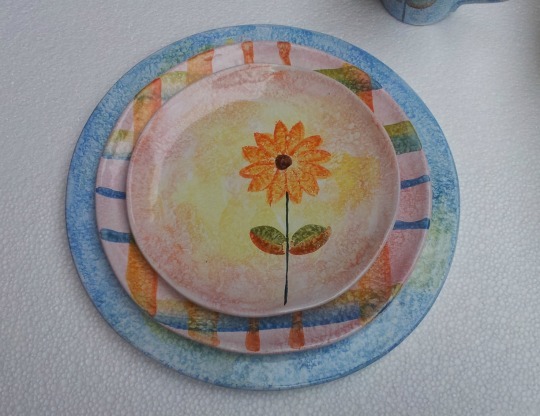 We’re happy to add the lovely Primavera line to our selection of handcrafted Italian dinnerware and ceramics. Though evocative of spring, this collection can find a home on your table yearlong – even, or perhaps especially, in the dead of winter when you need a break from bleak weather. Keep an eye out for this collection at the end of March! Til then, we’re forgetting the thermometer, putting winter behind us, and pulling our Primavera collection from the shelves to create a fresh tablescape. Hopefully, we can coax the warm weather out from wherever it’s cowering as we gather together to enjoy our meals. After all, primavera literally means spring – so if Mother Nature doesn’t get the hint, we’re not sure what to do! Tagged interiors, pattern, plaid, plaiddecor, plaidfashions, spring, springtrends.